We arrived in Bukhara, a bastion of well-preserved silk road buildings and monuments, on the afternoon of New Year’s Eve. For most Central Asians, this is the biggest holiday of the year with huge celebrations… but some unusual new restrictions put in place left the locals and ourselves wondering what the fate of these celebrations might be. 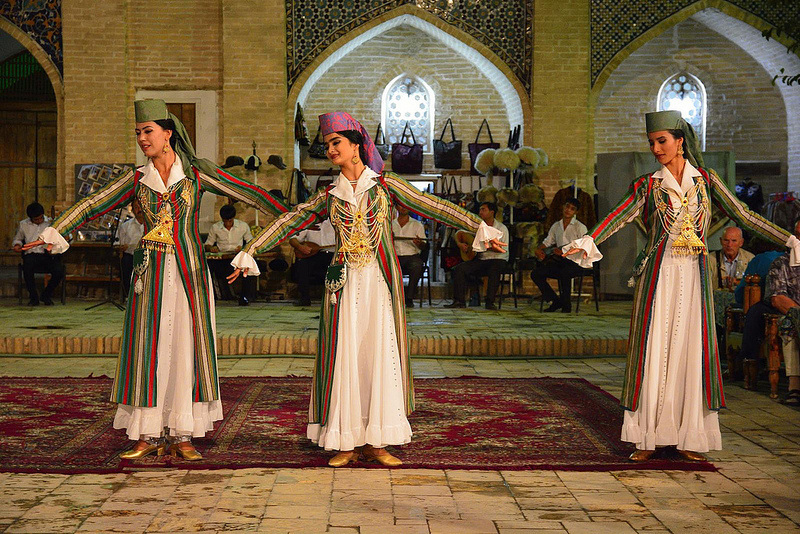 New Year’s celebrations in Uzbekistan are unlike the celebrations we typically think of. For them, it is a family event with lots of interaction, eating, and drinking. Each city will have a big street party around the New Year tree (which looks remarkably like what we call a Christmas tree! ), where everyone will gather for singing, dancing, fireworks, and the many other usual party activities. In 2016, however, Uzbekistan decided in its wisdom to ban restaurants from staying open after 10pm. This peculiar decision left everyone wondering what this would mean for the usually raging street parties. Would people bother to come out at all? In a heartwarming display of hospitality, a local family invited us for dinner at their private home, in their beautifully decorated dining room… but this wasn’t really the New Year’s party we’d been hoping for. Slowly the food stopped appearing and the bottles started to dry up, and by about 10pm things were beginning to wind down. Not willing to give up, we left the group to finish dinner and joined our local guide to drive down to the New Year tree to find out what, if anything, was happening. a few proper security checks. Our enthusiasm began to fade as we saw there were only a few people near the tree, with what seemed to be a steady stream of people leaving. A nearby stage stood empty, hinting once again that the festivities were coming to an end. We asked how long the sad-looking “celebrations” would be happening for, and if it was ok for us to bring a group of foreigners. A few enthusiastic celebrators told us that, while they weren’t sure how long anything would be going on for, they hoped they’d still have a few people around at midnight… and yes of course we could bring a group of foreigners! We went back to collect the group, hopeful the party would continue on, and returned about twenty minutes later. As we neared the edge of the dwindling crowd, one of our Young Pioneers, Tan, broke out into dance. Within an instant, a handful of locals had turned their attention from whatever was happening on the stage at that point… to us! A few seconds later Anna joined in the dancing and, within a couple of minutes, our whole group was grooving with a solid circle of locals forming around us. As more people flocked around us, we could hear them clapping and cheering us on, encouraging our gesticulating ever further. At this point the police started moving closer and we hesitated, hoping we weren’t about to reenact a Kevin Bacon flic and get in trouble with the law for dancing. Fortunately, instead of stopping us, they merely blocked the spectating circle from moving any closer towards us. Realising that we weren’t getting busted for boogying, a few locals began to join in and bust some moves as well, and suddenly the party was on! An hour or so later, and the crowd had grown from around 200 to over 1,000 people, and we were right there in the centre of this gigantic mosh-pit we had created. Before we knew it, the time was 11:40pm, and all at once the festivities came to a screeching halt. The music stopped, the police moved the crowd back, and the final minutes of 2015 were spent listening to a journalist recite the president’s address- first in Uzbek, then in Russian. Certainly not your typical New Year’s countdown- but memorable to say the least. Tired from our dancing, we retrieved our bottle of sparkling wine (definitely not Champagne) from the policeman tasked with ensuring no alcohol entered the city square, poured our one bottle into sixteen plastic cups, and cheerfully toasted the New Year. Making our way back to the hotel, we had all but resigned ourselves to bed when, upon our return to the hotel, we were met by a group of Russians waiting until 2:00am for Putin’s speech from Moscow… so we caught our second wind, and the party continued! The following day, our local guide told us of a conversation he’d had with local policemen at the party: before our arrival, the locals had been hesitant to really get the party going, uncertain of how wild they could be with the new regulations in place. Meanwhile, the police had been standing by worried everyone would leave from boredom, yet also knowing if things picked up too much they’d have to be the ones to shut it down. Our entrance turned out to be the perfect kindling to get the party started. Together with our spontaneous dancing, and the locals’ enthusiastic response, everyone was able to let their hair down and have a New Year’s celebration that won’t be soon forgotten. Come party with the locals!